The poet, Joyce Kilmer once wrote that “only God can make a tree” and she was right. Many important events in the Bible happened on or around trees. But I would like to consider what are arguably two of the most significant events in history that involved trees. To look at the first event, we need to go back to the Garden of Eden. From the beginning, Adam lived in complete freedom to partake from any tree in the garden, except for one. Pretty simple, right? But as we all know, Adam and Eve both ate from the tree after satan convinced them that Jehovah was trying to withhold something from them. Once they stopped trusting what God had told them, they were setup to fall. After the Fall in the garden, they were kicked out of paradise and sin, or a sinful nature that predisposes us to sinfulness, passed to all. It was like someone dented the bread pan and from then on every loaf had a defect. But that was not to be the end. Even though death and sin entered the world because of what happened on a tree, the remedy for our situation would come from a “Second Adam”, at it would also happen at a tree. Jesus took the cross, a tree of death, and turned it into the new tree of life for us. An implement of torture and cruel punishment for sin, is now a source of life and forgiveness of sin. Yes, Joyce Kilmer was right when she wrote that “that only God can make a tree”, but even more significantly, only God can take a tree of death, and make it a tree of life! Where the first Adam fell and brought death, the second Adam has paid for life and immortality for all who would receive it! Whenever there is a patient with a newly discovered medical condition, one of the first questions families ask the physician is, “what’s the prognosis?”. They do this because they want to know what the eventual outcome will be for their friend or family member. There is a measure of comfort in knowing what to expect, for we generally fear the unknown. As nearly as possible, the doctor gives the expected outcome so that people can make intelligent decisions about medical care. With that in mind, doctors are very careful about the prognosis they give, since life and death decisions are often made based on their professional opinion. If they are wrong, the results can be tragic. We serve a God who also makes a prognosis. And when He does, it is always accurate and we can make decisions of eternal significance based on what he says. We can do that because Jehovah has foreknowledge. The Greek word used in the New Testament that is translated as “foreknowledge” is the word “prognosis”. Unlike with humans, when God gives a prognosis based on His omniscient foreknowledge, it is never wrong. Let’s see a few times this word is used and look at what it tells us about our Heavenly Father. The crucifixion of Jesus was not an unforeseen hiccup in the plan of God. One of the things that made it “the fulness of time” for Jesus to come was that Jehovah knew that if Jesus came in the flesh at this point in history He would be crucified. That was the point, since Jesus was coming to seek and save the lost. Does that mean God manipulated those responsible and somehow forced them to crucify Jesus? Of course not! Fore knowing something and foreordaining something are two very different things. God foreknew what evil men would do and simply accommodated it into His plan. But why would The Father allow that and even plan for it? 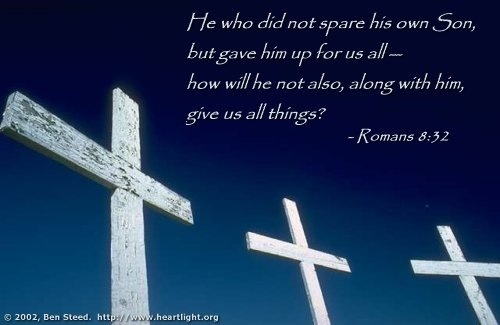 Out of love for us and for our salvation. God had planned that all who would come to Christ for salvation would be saved. He didn’t foreordain some to come and others not to come. Our election was based on foreknowledge that we would come to Him(1 Peter 1:2). And knowing that, He made provision for all who would come to make it from justification to glorification. What was necessary was for us was to be “in Christ”. But this says something more profound about his love for us. Paul, in the letter to the Christians at Ephesus, says that our election (which we already saw was according to foreknowledge) occurred before the foundation of the world. He chose us by choosing Christ as our Savior. In doing so, He was choosing all who are “in Christ” as well. That means, before the world existed, Jehovah God knew what would happen to His creation and looked down through time. In His foreknowledge He knew each of us individually who would respond to the Gospel. He looked at each of us, knowing how we would blow it, and how we would be helpless, but also that we would come to Him someday, and said “yes, I will go to the cross for every one of them that come to Him in faith.” He looked down the corridors of time and saw John, Tom, Susan, Whit, Cory, Hannah, (your name here), and even me, and said “they are worth it. I will go and suffer and give my life, because if I do, they will come to me and I can save them.” Stop and contemplate that for a minute, or an hour, or a day. Jesus’ prognosis for each one of us was that if He would bleed and die and pay the debt for our sins, we would respond. And based on that, He had compassion on us, emptied Himself, and took the form of a servant, being obedient unto death, even the death of the cross (Philippians 2). There is something to dwell on the next time you take Communion. A few years ago, a song was recorded by Hillsongs Australia called, “So You Would Come” and I think the words are an appropriate way to conclude this post. Healing is a popular subject these days. From medical advances that boggle the mind, to seeking out alternative cures and dietary solutions, it seems there is a universal desire to be healed. Better yet, we want to walk in health so we won’t need to be healed! It is no different in the religious world. A quick survey of religious broadcasting reveals numerous teachers preaching to packed arenas about divine healing. Prominent among such teaching is the idea that Jesus did not just pay for our spiritual healing on the cross, but that his suffering, specifically his stripes, paid for our physical healing as well. “Our healing has already been accomplished” they say. All we have to do is to have faith and not doubt, and receive the healing that is rightfully ours. But is this accurate teaching? Let’s see what the Bible says. In the faith healing teaching, Isaiah 53 is a foundational passage. Let’s take a look at it and see if it is being properly applied or not. On the face of it, there seem to be two very compelling statements here about healing. In verse 4, The Suffering Servant (Jesus) is said to have lifted up our illnesses and carried our pain. And if one goes with the assumption that this verse is talking exclusively about the crucifixion, it looks like a reasonable interpretation of the verse. Fortunately, this verse is quoted in the Gospel of Matthew, chapter 8 verses 16-17, so we don’t have to guess at when this verse was fulfilled. Matthew records the following incident. As anyone can see, this verse is not applied to all disease for all time being paid for at the cross. 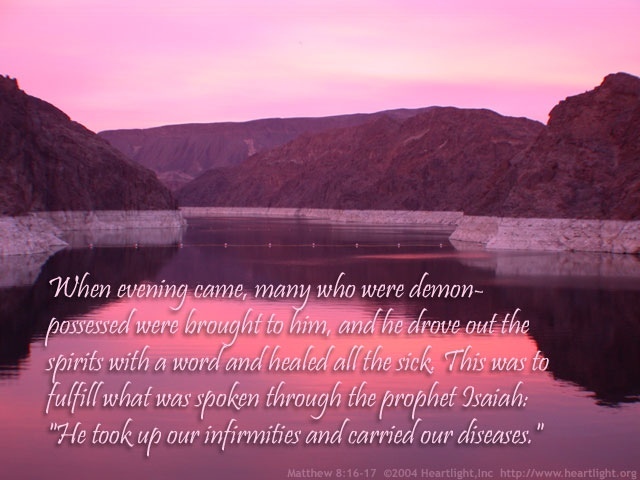 Through inspiration, the Apostle Matthew says that the miraculous ability Jesus had to heal the sick and drive out demons from those who were possessed was a sign that he was the Suffering Servant who would be our Messiah. In other words, they could recognize who Jesus was by his ability to heal the sick! But what about Isaiah’s statement that by his wounds we have been healed? 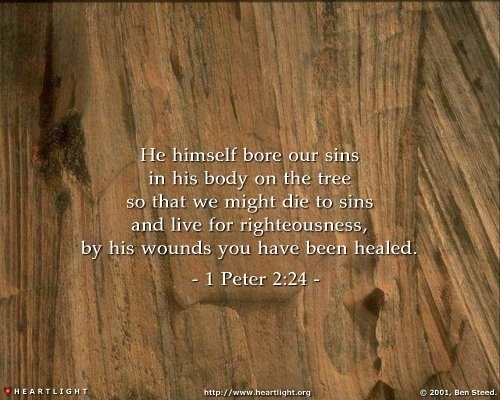 It is true that this portion of the verse could still be talking about our healing being paid for on the cross. True, that is, unless the New Testament apostles applied it to something else instead. Let’s see how this verse is applied by the Apostle Peter. At first this passage looks more promising because Peter is talking about what happened at the crucifixion of Jesus here. But again, how is the quote from Isaiah applied? To the bearing of our sins in his body on the cross, which would enable us to die to sin and live to righteousness (kind of sounds like baptism here). The result of this healing from the wounds he endured was verse 25. We are no longer like sheep who were astray, but have returned to God. His wounds purchased for us, not physical healing, but spiritual healing of our souls and our reconciliation to God! Once again, after careful examination, we find that the faith healers have misapplied this verse. So can God heal today? According to Psalm 103, all healing of any kind is a gift from God. And surely God would not command us to pray for one another when we are sick if there were no benefit from it, or if said healing was not his will. In fact, during his earthly ministry, there is no record of Jesus ever declining to heal anyone who asked. But that was during his earthly ministry, and during the time of the apostles, who confirmed the validity of their message as being from God by signs and wonders (Hebrews 2:4) And one day, those of us who will spend eternity in his glorious presence will be freed from every disease and pain. Until that time, enough of television and radio preachers who tell the sick that their healing is now, and they just have to receive it by faith. And if they are not healed, it is because they lacked that faith. To heap such guilt and condemnation on one who is suffering is beyond cruel, and only adds a deeper layer of suffering to the physical pain they are enduring. This is especially true of those who, like Simon the Sorcerer in Acts 8, tell desperate people that God is holding their healing but will pour it out upon them if they send in money. No, the ultimate healing will take place in the dwelling place of God, not on this fallen earth.